The same great doctrines, as in St. Paul's epistles, are here applied to same practical purposes. And this epistle is remarkable for the sweetness, gentleness, and humble love, with which it is written. It gives a short, and yet a very clear summary, both of the consolations and the instructions needful for the encouragement and direction of a Christian in his journey to heaven, raising his thoughts and desires to that happiness, and strengthening him against all opposition in the way, both from corruption within, and temptations and afflictions without.The apostle blesses God for his special benefits through Christ. (1-9) Salvation by Christ foretold in ancient prophecy. (10-12) All are exhorted to holy conversation. (13-16) Such as is suitable to their principles, privileges, and obligations. (17-25)1-9 This epistle is addressed to believers in general, who are strangers in every city or country where they live, and are scattered through the nations. These are to ascribe their salvation to the electing love of the Father, the redemption of the Son, and the sanctification of the Holy Ghost; and so to give glory to one God in three Persons, into whose name they had been baptized. Hope, in the world's phrase, refers only to an uncertain good, for all worldly hopes are tottering, built upon sand, and the worldling's hopes of heaven are blind and groundless conjectures. But the hope of the sons of the living God is a living hope; not only as to its object, but as to its effect also. It enlivens and comforts in all distresses, enables to meet and get over all difficulties. Mercy is the spring of all this; yea, great mercy and manifold mercy. And this well-grounded hope of salvation, is an active and living principle of obedience in the soul of the believer. The matter of a Christian's joy, is the remembrance of the happiness laid up for him. It is incorruptible, it cannot come to nothing, it is an estate that cannot be spent. Also undefiled; this signifies its purity and perfection. And it fadeth not; is not sometimes more or less pleasant, but ever the same, still like itself. All possessions here are stained with defects and failings; still something is wanting: fair houses have sad cares flying about the gilded and ceiled roofs; soft beds and full tables, are often with sick bodies and uneasy stomachs. All possessions are stained with sin, either in getting or in using them. How ready we are to turn the things we possess into occasions and instruments of sin, and to think there is no liberty or delight in their use, without abusing them! Worldly possessions are uncertain and soon pass away, like the flowers and plants of the field. That must be of the greatest worth, which is laid up in the highest and best place, in heaven. Happy are those whose hearts the Holy Spirit sets on this inheritance. God not only gives his people grace, but preserves them unto glory. Every believer has always something wherein he may greatly rejoice; it should show itself in the countenance and conduct. The Lord does not willingly afflict, yet his wise love often appoints sharp trials, to show his people their hearts, and to do them good at the latter end. Gold does not increase by trial in the fire, it becomes less; but faith is made firm, and multiplied, by troubles and afflictions. Gold must perish at last, and can only purchase perishing things, while the trial of faith will be found to praise, and honour, and glory. Let this reconcile us to present afflictions. Seek then to believe Christ's excellence in himself, and his love to us; this will kindle such a fire in the heart as will make it rise up in a sacrifice of love to him. And the glory of God and our own happiness are so united, that if we sincerely seek the one now, we shall attain the other when the soul shall no more be subject to evil. The certainty of this hope is as if believers had already received it. 10-12 Jesus Christ was the main subject of the prophets' studies. Their inquiry into the sufferings of Christ and the glories that should follow, would lead to a view of the whole gospel, the sum whereof is, That Christ Jesus was delivered for our offences, and raised again for our justification. God is pleased to answer our necessities rather than our requests. 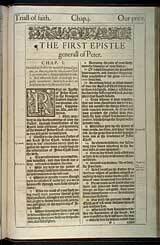 The doctrine of the prophets, and that of the apostles, exactly agree, as coming from the same Spirit of God. The gospel is the ministration of the Spirit; its success depends upon his operation and blessing. Let us then search diligently those Scriptures which contain the doctrines of salvation. 13-16 As the traveller, the racer, the warrior, and the labourer, gathered in their long and loose garments, that they might be ready in their business, so let Christians do by their minds and affections. Be sober, be watchful against all spiritual dangers and enemies, and be temperate in all behaviour. Be sober-minded in opinion, as well as in practice, and humble in your judgment of yourselves. A strong and perfect trust in the grace of God, is agreeable with best endeavours in our duty. Holiness is the desire and duty of every Christian. It must be in all affairs, in every condition, and towards all people. We must especially watch and pray against the sins to which we are inclined. The written word of God is the surest rule of a Christian's life, and by this rule we are commanded to be holy every way. God makes those holy whom he saves. 17-25 Holy confidence in God as a Father, and awful fear of him as a Judge, agree together; and to regard God always as a Judge, makes him dear to us as a Father. If believers do evil, God will visit them with corrections. Then, let Christians not doubt God's faithfulness to his promises, nor give way to enslaving dread of his wrath, but let them reverence his holiness. The fearless professor is defenceless, and Satan takes him captive at his will; the desponding professor has no heart to avail himself of his advantages, and is easily brought to surrender. The price paid for man's redemption was the precious blood of Christ. Not only openly wicked, but unprofitable conversation is highly dangerous, though it may plead custom. It is folly to resolve, I will live and die in such a way, because my forefathers did so. God had purposes of special favour toward his people, long before he made manifest such grace unto them. But the clearness of light, the supports of faith, the power of ordinances, are all much greater since Christ came upon earth, than they were before. The comfort is, that being by faith made one with Christ, his present glory is an assurance that where he is we shall be also, #Joh 14:3|. The soul must be purified, before it can give up its own desires and indulgences. And the word of God planted in the heart by the Holy Ghost, is a means of spiritual life, stirring up to our duty, working a total change in the dispositions and affections of the soul, till it brings to eternal life. In contrast with the excellence of the renewed spiritual man, as born again, observe the vanity of the natural man. In his life, and in his fall, he is like grass, the flower of grass, which soon withers and dies away. We should hear, and thus receive and love, the holy, living word, and rather hazard all than lose it; and we must banish all other things from the place due to it. We should lodge it in our hearts as our only treasures here, and the certain pledge of the treasure of glory laid up for believers in heaven. Verse 19: Jehovah Godpaid the highest price possible in order to buy us back and that was the blood of his firstborn son, Jesus Christ. Verse 14: to live by Bible standards we must make major changes in our thinking and conduct.